I am an alcoholic. It took me quite a few years to accept that, but I finally grew to understand I had an addiction to alcohol; wine, in particular, for those interested. And so followed two in-patient rehabs, counseling, Alcoholics Anonymous (AA) meetings, medication, and everything else that modern treatment for alcoholism recommended. In the end, none of it worked. Needless to say, I grew despondent and hopeless. If what had seemed to work for millions of others didn’t work for me, what hope did I have? I had always toyed with the idea of getting a tattoo, but each time I went into a shop, the books filled with thousands of designs never really reached me. And I was never about to get a tat for tat’s sake. And so I never did. At least, until one day when, reading a book on Roman history, I came across the tale of Hannibal, the general who led his army over the Alps of northern Italy to launch a surprise attack against Rome. 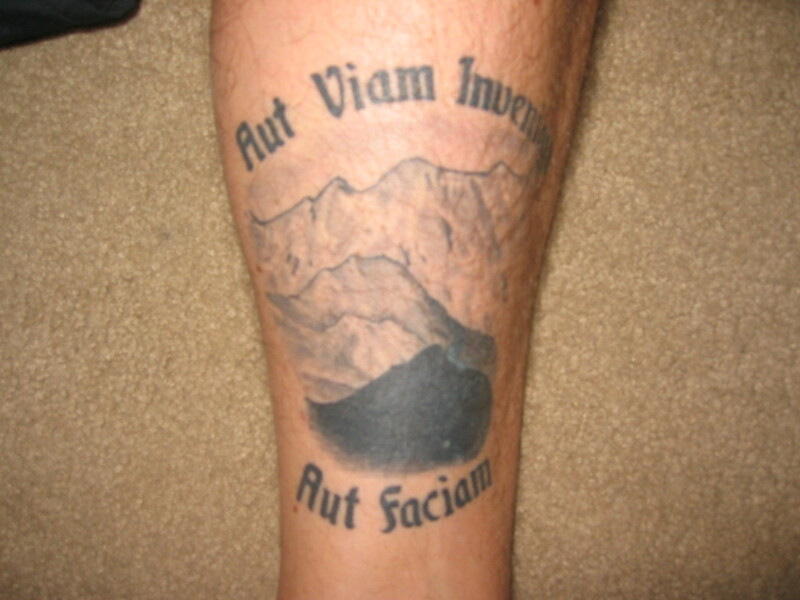 When Hannibal approached the all-too formidable Alps, instead of throwing his hands up and turning around, was reportedly quoted as saying, “Aut viam inveniam aut faciam.” The translation of this Latin quote is roughly: “I will find a way, or I will make one.” Hannibal did just that, and thus followed a string of uninterrupted military victories against mighty Rome. When I read that for the first time, it immediately struck me. All the tried and true methods, AA, medication, etc., simply did not work for me. I had to find my own way, find what worked for me, not anybody else. Following the herd was safe, but ultimately self-defeating. Like a group of pack animals, the weak are safe as long as they stay in the middle of the herd. Once sick or injured, they are inevitably left behind and resigned to whatever fate befalls them. I felt exactly the same way. The cures and fixes that worked for others simply did not work for me. I had to find my own way. And that’s what I’ve been doing ever since I had that realization: finding my own path. Thus, I went in search of a good photo of the Alps, an image that I could look at and say “crap, I’d never make it over that.” I envisioned what Hannibal must have been looking at when he reached the valley below and looked up at those imposing peaks. Thus was born the first of the two tattoos. 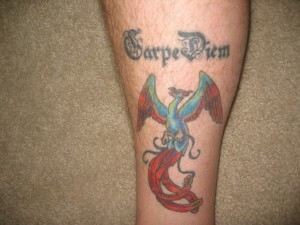 And that takes us on to the second tattoo, a phoenix rising with the phrase “Carpe diem” above it. In ancient Greek mythology, the phoenix (for those not familiar with the story) was a brightly-colored bird that lived for hundreds of years. Upon reaching its final day, it would, along with its nest, be consumed by fire and reduced to ashes. Very soon after, however, it would be reborn, just as brightly colored and filled with life as it was during its previous existence (see photo #2). Coupled with the phrase “Carpe diem” (Latin for “seize the day”), this one really was a no-brainer for me. It was one of those tattoos that felt as natural getting as breathing. Having explained my story, however briefly, you can probably guess for yourself why this image combination appealed to me as it did. All in all, these tattoos remind me that – at the risk of sounding like Dr. Phil – that every day is a chance to start over. No guilt, no remorse, just a clean slate. Beating myself up over falling off the wagon those many times that I did does me absolutely no good. I just makes me miserable and more prone to climbing back into the bottle, and that ain’t gonna happen. In closing, I hope the reader will, no matter the problem he or she is grappling with, realize that they have the ability and the right to put yesterday behind them and start over every single morning. Corny sounding, maybe, but that’s the truth as I see it, and it has saved my life.